#1 “Greenland” is the home of the new Planet Hulk storyline and its neighbor #2 “Dystopia” the home of the other Hulk centric storyline Future Imperfect. The “Domain of Apocalypse” in #3 ties into the Age of Apocalypse series, with #5 “Technopolis” the home of the Armor Wars series. #8 “The Regency” holds a world where Peter Parker and Mary Jane Watson are still married and in fact have a child. #17 “Marville,” despite having the same unfortunate name as a much despised comic series, appears to be the home of the Avengers vs. X-Men storyline. Marvel’s Civil War lives on in space #22 “The Warzone,” with the X-Men centric stories House of M taking spot #29 “The Monarchy of M,” Years of Future Past in #30 “Sentinel Territories,” Old Man Logan in #31 “The Wastelands,” and X-Men ’92 in #33 Westchester. #39 houses the Age of Ultron vs. Marvel Zombies series with New Xandar occupying spot #40 and the new Infinity Gauntlet series. Space #20 is the most interesting, however, as it features not only the Manhattan of the regular “616” Marvel Universe but it has also been combined with the Manhattan of the Ultimate Marvel Universe, in addition to the Inhuman kingdom of Attilan and Monster Metropolis as seen in the pages of Deadpool. #20 is also the only spot on Battleworld that two different comics will call home, Attilan Rising and The End, the later of which certainly seems to spell doom for the Ultimate Universe. We’ve figured out a few of the other spots on the map such as #9 “King James’ England,” Marvel 1602; #10 “Weirdworld” from the Doug Moench/Mike Ploog series; #11 “K’un Lun,” the world where Iron Fist gained his powers; #18 “The Eye of Agamotto,” a precious relic from the pages of Doctor Strange; #23 “New Quack City” is clearly Howard the Duck; #25 Valley of Flame is the home of Devil Dinosaur; #26 The Hydra Empire is the long running “Secret Empire” of HYRDA; #27 2099 the far future home to Spider-Man 2099 among others; #28 Hala Field is the birthplace of Ronan The Accuser; and #38 “Deadlands” is the home of the Marvel Zombies. There are still a few others within the Battleworld that have us scratching our heads though, such as #13 “New Mars,” could this be John Carter? Is #24 “The Far East” the Marvel Manga-Verse? And is #34 “Killville” a play on Arcade’s “Murderworld” from Avengers Arena (suspect, given it’s proximity to #35 “Arcadia”)? But with many more left unsolved, and three totally classified at this point, sound off with your own theories and thoughts below! 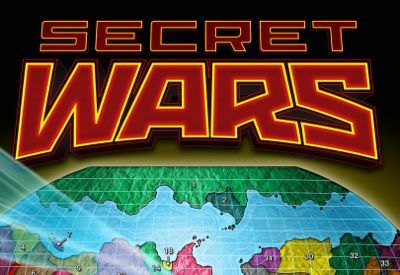 Secret Wars is set to begin in May 2015 with Jonathan Hickman writing and art by Esad Ribic. Click on the image to see a much bigger version!